fighting big wind. 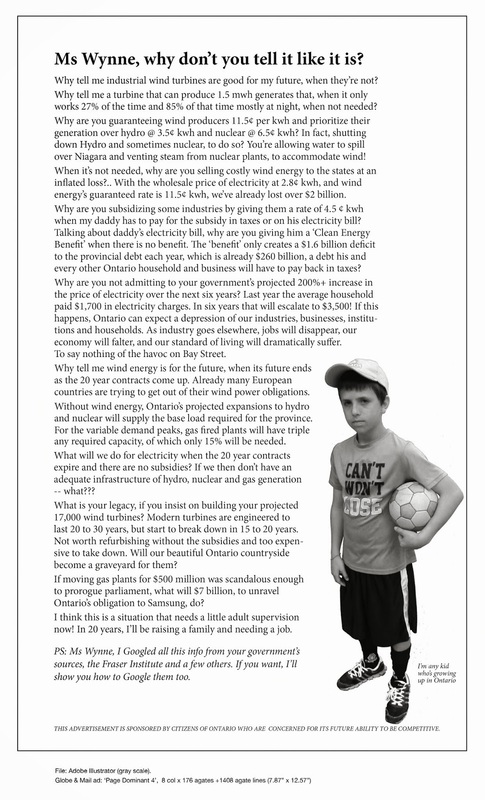 | Mothers Against Wind Turbines Inc.
Category Archives: fighting big wind. fighting big wind., Green Energy, Unite the Fight! Laura and Paul are retiring and we wish them all the best on their new adventures. Well, after 6 years, it’s time to close down QuixotesLastStand. I’ve been an environmentalist crusader since my first walkathon to save the whales, before I was even a teenager. Now, almost 50 years later, it’s time to pass the torch to a younger generation. With his degree in forestry, Paul has been relentless in his desire to get people to understand the importance and value of keeping and planting MORE trees, to help the environment, rather than cutting them down to put up useless, inefficient and unreliable wind turbines whose destruction to the earth far outweighs any meagre benefit they give. Paul and I have done what we could to warn of the serious environmental issues surrounding industrial wind turbines and the greedy multinational billion dollar corporations and politicians who get rich off of them. We, as a whole, can work to help this planet without seniors dying of hypothermia because they can’t pay their electric bill, or by forcing families into energy poverty resulting in some losing their homes. For now, Paul and I would like to just spend our remaining years, enjoying the fruits of our many years of labour, without the stress of daily combat. This site will close down in a few weeks. Thank you to all of our thousands of followers over the years. We value your support and wish you well in your continued crusade against the tyranny of New World Order globalist liberals whose sole aim is to rob us of the freedoms and rights we’ve enjoyed for so long and to deprive our children and grandchildren of the good fortunes and first world basic necessities and conveniences we’ve taken for granted. Should anyone wish to take over Quixotes, please leave a comment below. It is a treasure trove of research articles and important items related to the ecological devastation wrought by these monstrous machines. The number-one challenge of our times is to separate the wheat from the chaff. To assist in this task, we are blessed with more information than ever before – but we are also simultaneously burdened with more misinformation than any prior generation has ever had to deal with. We look back and wonder how trusting citizens were so easily victimized by snake oil salesmen, but today, in the golden age of cons, we are being duped on a daily basis. As a representative matter (and a national issue of great significance), let’s look at what’s happening with industrial wind energy. The primary reason why wind energy has been a success has nothing to do with wind energy! Instead, its success is 100% due to the fact that wind energy proponents are masterful lobbyists. If one reads The Business of America Is Lobbying, it’s apparent that the wind industry has used every trick in the book, and then written some of its own. For example: Wind lobbyists have successfully infiltrated our language with totally inaccurate and misleading terminology, such as “wind farms” and “clean energy.” Neither exists. For example: Wind marketers have successfully portrayed their product as “Free, Clean, and Green” – despite it being none of those. The reason they have coined these malapropisms is simple: those who control the words control the narrative. For example: Wind salespeople have successfully convinced financially distressed communities that hosting a wind project will be a economic windfall – even though numerous studies from independent experts indicate that the net local economic impact could well be negative. For example: Wind-peddlers have successfully sold technically challenged local representatives that the wind-developer is their friend and business partner – even though these sophisticated and aggressive entrepreneurs typically look at these rural people as rubes and marks, and their number-one focus is to make as much money as possible, at the rubes’ expense. For example: Wind developers have successfully persuaded much of the public that wind energy is an inevitable matter, so fighting it is a lost cause. The reality is that in many cases, local communities can effectively defend themselves by simply passing a proper wind ordinance. For example: Wind-supporters have successfully imparted the belief that a certain wind project will power 20,000 homes – even though that project will not actually power a single home 24/7/365. For example: Wind advocates employ a sleight-of-hand tactic to dismiss noise complaints by claiming that “wind turbines don’t make any more noise than a refrigerator.” The fact is that the main acoustical concern with wind turbines is the infrasound generated (which is below our level of hearing). So discussing the audible part of turbine noise purposefully distracts from the serious inaudible (but still very much experienced) noise issue. For example: Wind propagandists say that wind energy is saving the environment – even though the evidence indicates that it is environmentally destructive on multiple fronts. For example: Wind-promoters have successfully conveyed the idea that wind energy is a low-cost option of electricity – even though when all its costs are fully accounted for, wind energy can be three to five times as expensive as traditional electricity sources. For example: Wind advocates have successfully communicated the notion that using more wind will directly result in the closure of coal plants – even though 10,000 wind turbines could never equal the performance of even a single coal facility. For example: Wind-boosters have successfully disseminated the impression that wind is a major and essential contributor to preventing climate change – even though there is no empirical scientific proof that wind energy saves any consequential CO2. For example: Wind champions have successfully relayed the conviction that the DoD Clearinghouse assures us that wind projects will not adversely affect the mission or operational readiness of our military or our national security – even though the DoD Clearinghouse was set up to accommodate wind energy (not the military), and the actual process is much more about promoting political correctness than protecting our national defense. I could go on and on, as the list of wind lobbyists’ deceptions is distressingly long. That said, there is an additional major falsehood that needs to be exposed: that there is such a thing as wind energy by itself. This seemingly innocuous deceit is actually extraordinarily important. The fact is that there is no such animal on the grid as wind energy by itself. What actually typically exists is a “Wind+Gas” package. This is mandated by the inescapable reality of wind energy’s unrelentingly unpredictable and uncontrollable output. No conventional source of electrical energy has these characteristics, so none need this special augmentation. For example, it should be apparent that wind energy (i.e., the Wind+Gas package) is not a CO2 zero-emitter. In fact, due to other technicalities (never acknowledged by wind lobbyists) some studies have concluded that gas (combined cycle) by itself produces less CO2 than the Wind+Gas package. Let me restate that extraordinary finding: gas can produce less CO2 than wind energy does! Is the success of wind energy due to the sophistication of the con artists they’ve engaged or to our gullibility? In either case, the takeaway is that lobbyists are not reliable sources of information, especially when it involves significant money, our health, or our national security. The bottom line is that wind energy is palliative pabulum, not suitable for prime time. *Some sample studies and reports about the Wind+Gas package: one, two, three, four, five, six, seven, eight, nine, ten and eleven. I write this with the industrial wind turbines whomping through my family home. A very uncomfortable pressure in my head. Pin like feelings in my temples. The pressure in my frontal lobe is most uncomfortable and makes it hard to maintain focus. My neck and shoulders are stiff and sore. Blaring tinnitus wears on my patience. A silent moment is lost. The pressure in my throat is like I gulped a chunk of food that is stuck. I can drink all the water I want to flush that sensation, but that won’t go away until I can leave my home for hours in search of respite. The heart palpitations used to scare the bejesus out of me. When they first happened I went to the hospital. Heart palpitations are my new norm : living in the Niagara Region Wind Farm. The command to mentally force the switch to caution mode is not a natural transition when returning home. I have a scrape on my back this morning. When I returned home last night I lost my balance in my closet and took out a shelf. My freedom to dance like nobody is watching has been hijacked. Each step has become methodical. I used to take 2 steps at a time and run these stairs. The stair challenge was my version of being active when my days were bogged down with paperwork. Now I walk like I am an arthritic 80 year old lady, step by step while holding the railing. The waves of vertigo are unpredictable. I am on my own a lot. The fear of falling has never been a daily thought. I have never had the burden to worry that no one is around to find or help me. That all change in November 2016. I’ve had to relearn to exist differently: cautiously in my home and on my property. I fell out back on my property when these turbine symptoms first started happening. That fall left me with a bruised leg, hip, and a small cut on my forehead. I have also fallen in the shower, which landed me tangled in the shower curtain and out of the tub. Am I living with an invisible medical ailment that has rendered me with some form of a disability? I am free from any debilitating diagnosis’s. I am otherwise a very healthy adult. Industrial Wind Turbines commenced operation November 2, 2016.